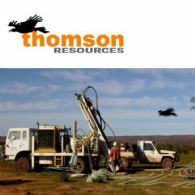 Thomson Resources Ltd (ASX:TMZ) submit their report for the Company for the half year ended 31 December 2018. 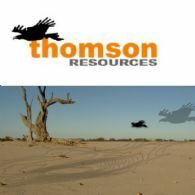 Thomson Resources (ASX:TMZ) is pleased to announce that it has entered into an agreement to acquire a gold exploration project in the Chillagoe district of north Queensland. The project comprises 6 EPMs, 3 of which are granted. The area covered (594 square km) lies 30km west of Chillagoe and near the Mungana, Red Dome and King Vol mining operations. 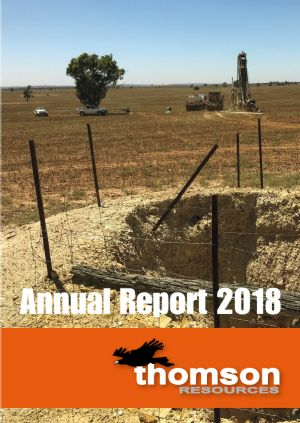 Thomson Resources (ASX:TMZ) is pleased to announce further encouraging gold assays from its December 2018 drilling program at the Harry Smith gold project, 30km south of Ardlethan, NSW. 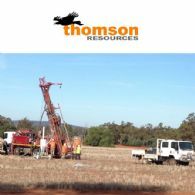 Thomson Resources (ASX:TMZ) is pleased to announce that it has received highly encouraging gold assays from its first four holes drilled in December 2018 at the Harry Smith gold project, 30km south of Ardlethan, NSW. 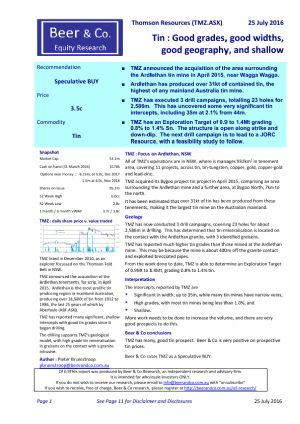 Thomson Resources (ASX:TMZ) is pleased to announce tin assays from its recent drill campaign at the Bygoo tin project near the old Ardlethan tin mine, NSW. Ten holes for 762m were drilled at Bygoo North to test the newly discovered shallow greisen zone that appeared to trend north-south through the historic Dumbrells Pit. 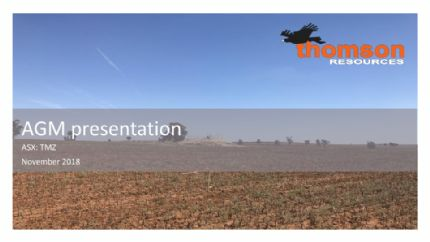 Thomson Resources Ltd (ASX:TMZ) provides the Company&apos;s Chairman Address to Shareholders. 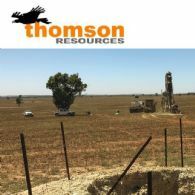 Thomson Resources Ltd (ASX:TMZ) is pleased to announce that its exploration licence application over a significant zinc exploration project near Lake Cargelligo in central NSW has been accepted by the Department of Planning and Environment. 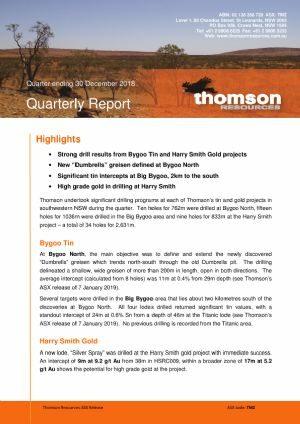 Thomson Resources (ASX:TMZ) is pleased to announce its drilling program at Bygoo Tin has commenced, with a program at Harry Smith Gold to follow.